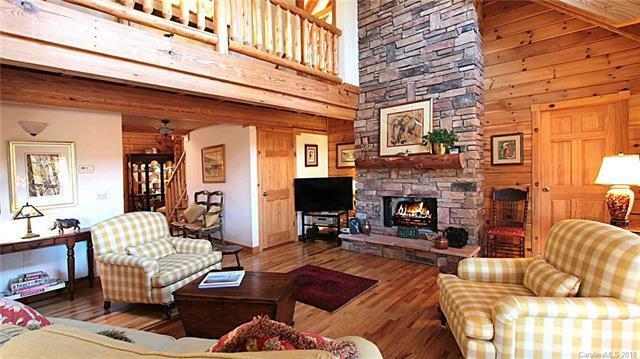 This beautiful log home is perfectly situated on 3 combined lots for over an acre of privacy, peace, and quiet. Large decks and multiple porches are ideal for outdoor living and entertaining. Inside you'll find a warm welcoming home with rich wood walls, vaulted wood ceilings, rustic beams, and plenty of windows for enjoying the natural setting. The master suite on the main floor has a beautifully updated bathroom (2018). The finished basement is great additional living space with interior or exterior access. When company comes, they will love their own guest suite with its private entrance apart from the main home. New roof in 2017. Main level and lower level garages. Located in Brevard's only gated community with 4 lakes, golf course, tennis, hiking, a newly renovated club house, and all the amenities you look for in a mountain life style. Close to DuPont State Forest, approx. 45 min. to Asheville, about an hour to Greenville, SC.